I believe that animals are intelligent. I believe that they have rich emotional lives and complex relationships with other animals (and with humans). I believe that many (most?) animal species possess some form of communication. Those who espouse this sort of belief are often told, “Don’t make the mistake of anthropomorphizing animal behavior.” That is, don’t attribute human motives and reasoning to an animal who does something for which there is a human analog: if a cat seems to hug another cat, don’t assume that it’s expressing affection. I agree that anthropomorphizing is a dangerous trap. But I think it’s just as wrong, and far more common, to dismiss animal behavior as lacking intelligence simply because it is alien to us. All of that is prologue, though, to a piece from Damn Interesting. It’s a piece that demonstrates the dangers of anthropomorphizing. It’s the tale of Clever Hans the Math Horse. 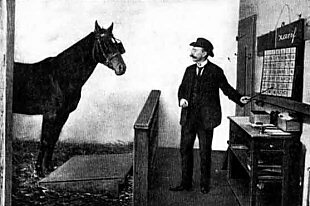 Clever Hans was a horse owned in the late 1800s by Wilhelm Von Osten, a German high school math teacher. Von Osten firmly believed that humanity had greatly underestimated the reasoning skills and intelligence of animals. To test his hypothesis, he took it upon himself to tutor a cat, a horse, and a bear in the ways of mathematics. The cat was indifferent to his efforts, and the bear seemed outright hostile, but the arab stallion named Hans showed some real promise. With further tutelage, Hans the horse learned to use his hoof to tap out numbers written on a blackboard. Much to Von Osten’s delight, jotting a “3” on the blackboard would prompt a tap-tap-tap from his pupil, a feat which Hans could repeat for any number under ten. See also this wikipedia entry. There are 1 reader responses to "Clever Hans the Math Horse". say”He means a quarter,Jim.”Jim then gave correct change.